This Pad Thai recipe is adapted from a fabulous little book called “Gourmet Meals in Crappy Little Kitchens” by Jennifer Schaertl (See another recipe I cooked from that book: stuffed chicken breast). It’s so easy, and you can dress it up or down (why do I feel like I’m talking about a purse or a pair of shoes?). The book says it makes 4 servings, but it’s definitely closer to 6-8. Or maybe I just overdo it on the cabbage. But whatever. I love cabbage. Thank you and you’re welcome. The ingredients are very forgiving, so if you don’t have something, a substitute will probably taste just as delicious. The first time I made it, I used egg noodles instead of rice noodles, oyster sauce instead of fish sauce, white vinegar instead of rice vinegar, brown sugar instead of cane sugar, olive oil instead of vegetable oil, ground ginger instead of fresh ginger, and red pepper flakes instead of red Thai chili pepper. See what I mean? My name is Hannah, and I have a problem with following directions. Actually, I am a MAJOR rule-follower, except when it comes to food. And maybe a few other random things. No, I don’t claim in any way to be normal. Why do you ask? 1 lb. boneless, skinless chicken cuts (I used some chicken breasts I had in the freezer, but you can use thighs or whatever you have. 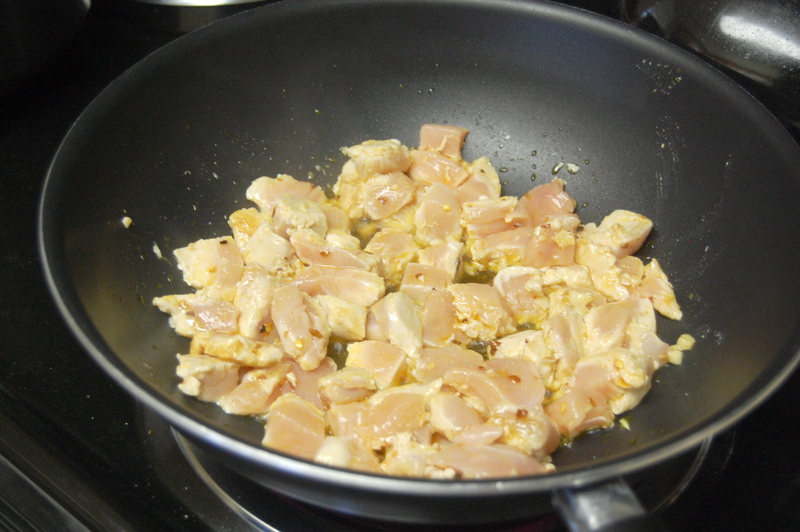 It equals about 2-4 chicken breasts depending on how much chicken you want.). Dice the chicken into small chunks. Cilantro is a very important ingredient too, but I didn’t have cilantro last night (insert sad eyes and a pitiful sniffle). If you happen to have cilantro, you’ll use a whole bunch. 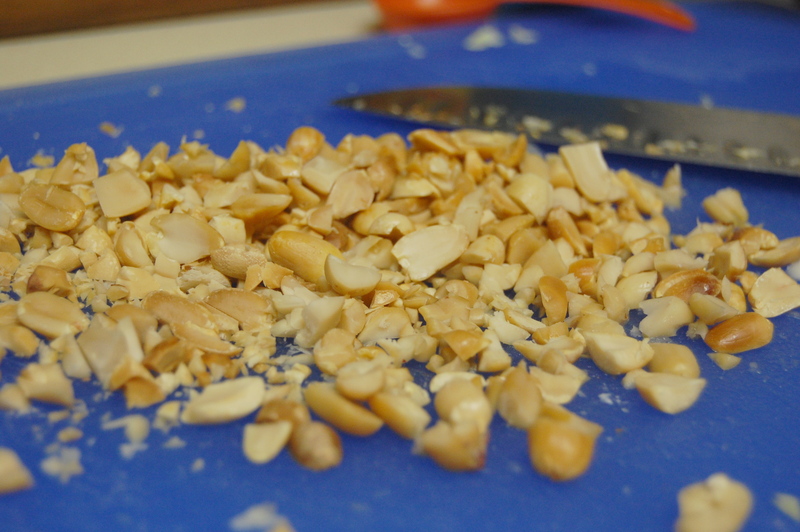 It is incredibly quick and easy (unless you shell the peanuts by hand like I did…). 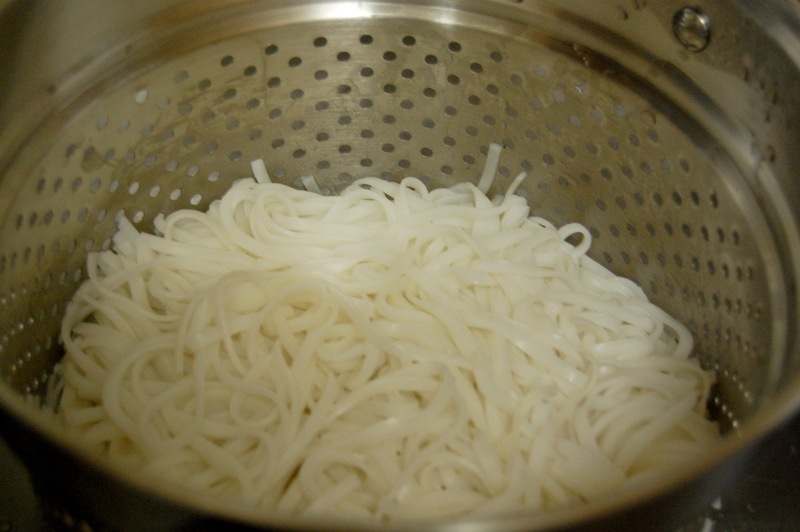 Boil some water, remove from heat, and put the dried rice noodles in the water to soften. The water should fully cover the noodles. The noodles can just chill out in the pot while you’re cooking the rest. After 20 minutes, strain all the water out of the noodles. Whisk the oyster sauce, vinegar and sugar in a small bowl and set aside. 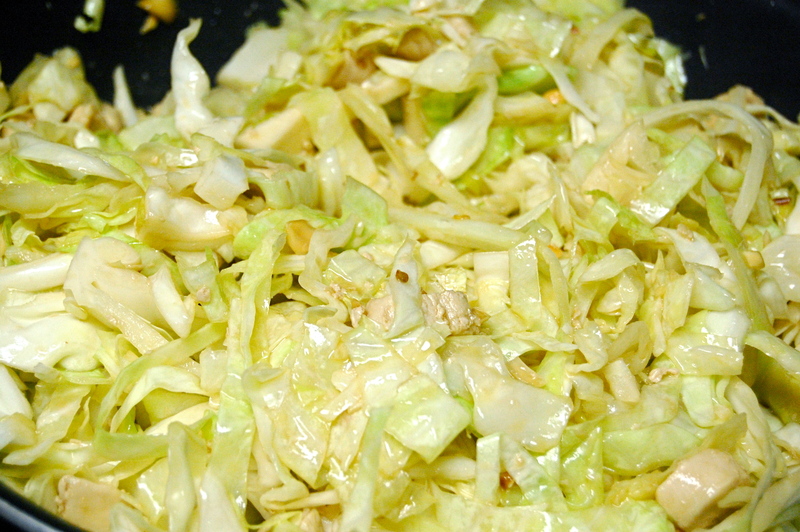 If you use the whole cabbage, you may want to make more sauce than the recipe suggests. Heat the olive/chili oil in the biggest sauté pan you have over medium-high heat. If you don’t have a big sauté pan or wok, use a big pot. Add the ginger, pepper flakes and garlic, sautéing for about 1 minute. 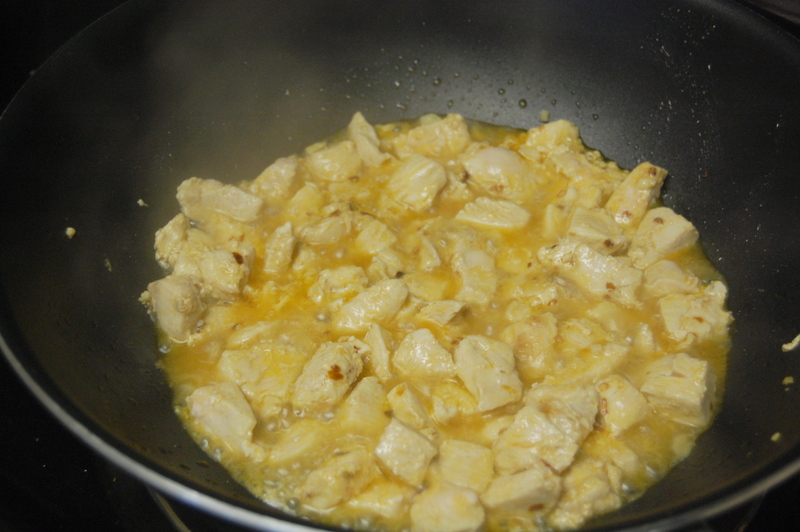 Pat the chicken pieces dry with a paper towel and add them to the pan. Sauté until completely cooked (2-4 minutes). Add the cabbage, 1/2 of the cilantro bunch, 1/2 of the peanuts, and the sauce mixture. Fold everything over until it’s all coated and mixed well. Sauté for a few minutes, until the cabbage begins to wilt. Stir in the drained noodles and toss until they’re warm and coated with sauce. Serve immediately, sprinkling some peanuts and cilantro on top. Garnish with a lime wedge (squeezing it over the noodles adds a wonderful flavor). It keeps really well in the refrigerator, too. I had leftovers for lunch today. You will probably want to chop your chicken into smaller pieces, but I was tired of cutting after shelling and chopping all the peanuts by hand. It’s amazing how long it takes to shell 1/2 cup of peanuts. 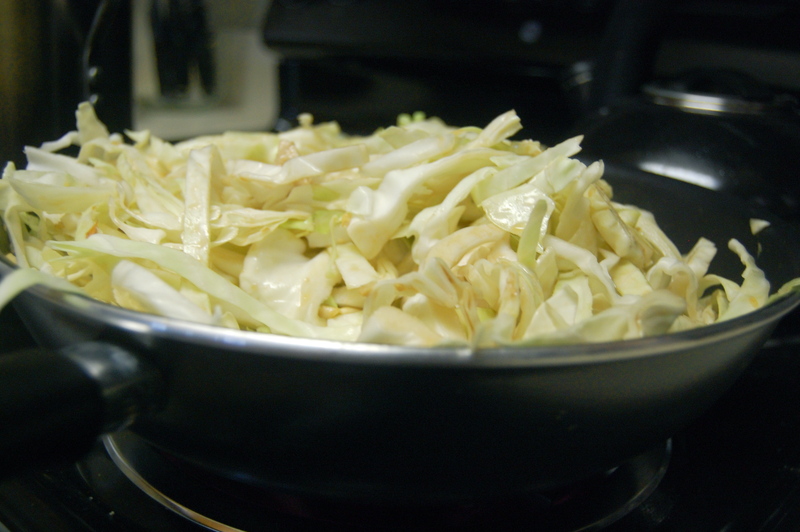 I have a huge pan, and this is AFTER the cabbage wilted down – and BEFORE adding the noodles. Let’s just say I’m busting out the big guns (14-inch wok) next time.